A deep conditioning treat for crazy-coloured hair! 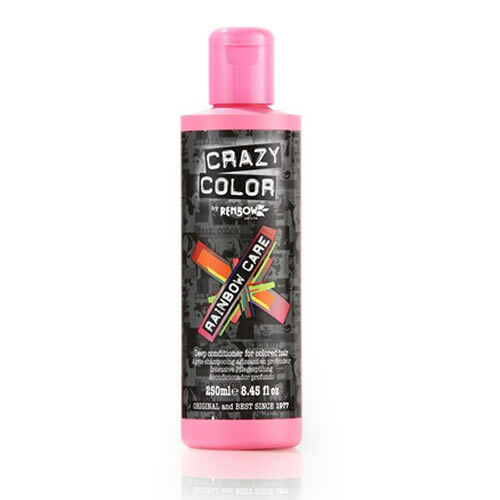 Renbow's Crazy Color Rainbow Care Conditioner is infused with a unique protein blend and oils to help maintain the strength, shine and suppleness of bleached and coloured hair. It's a deep conditioner that's salt and sulphate free and works to maintain optimum colour vibrancy as part of the Crazy Color range. Its blend of vitamin-rich sunflower seed oil, and nourishing brazil nut oil helps to seal and smooth the hair shaft with frequent use—all helping to sustain colour. Rinse out after 1-2 minutes if using frequently, or for a more intensive treatment, leave in for up to 10 minutes. £4.74 (inc. VAT) Why no VAT? We're a trade wholesaler and quote our prices without VAT to help our VAT-registered customers understand the true cost of a purchase. Fun and vibrant temporary colour sprays for blonde hair that are ammonia and peroxide-free. Available in Bubblegum, Graphite, Lavender, Marshmallow and Peachy Coral. Fabulous salt and sulphate-free range of shampoos that preserve the boldness and vibrancy of the craziest colour choices. Each shampoo comes in a 250-ml bottle. Crazy Color gives hair a vibrant and lively look, lasts on average for 3–6 shampoos. 39 shades available in 100-ml bottles.